PPH would like to announce that Sellers can now withdraw funds from their PPH wallet to a Payoneer card. This has been a major feature request by the PPH community for some time now. So those of you who already own a Payoneer card, you can finally use it whenever you withdraw your earnings from PPH. For those who don’t have a Payoneer card yet, you can order a new card through our site following a few, simple steps and start enjoying fast, secure international payments. Whatever the case, you just need to go to your Settings page, click on “Payments”, then “Edit” next to “Withdrawal Accounts” and click to add a Payoneer account to your PPH account. Login to your Payoneer account if you already have one or complete the steps needed to order a new Payoneer card. Global coverage – supported in more than 200 countries and multiple currencies. You can find the cost of the transaction for the Payoneer option and compare it with the other withdrawal methods in the list of Seller Fees mentioned here. Specifically for our Sellers in India, we have introduced the option to withdraw GBP funds to a Payoneer account which lets you get paid directly to your local bank account in your local currency. Payoneer’s global banking network enables you to get funds to a local bank in your country, significantly reducing the cost of getting paid and avoiding delays. 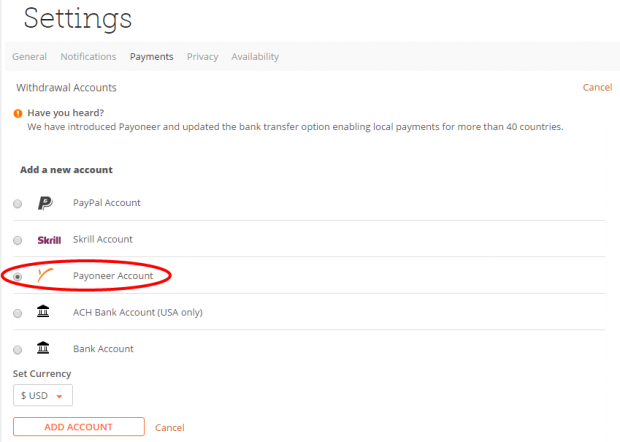 Go to Settings > Payments , click ‘Edit’ next to ‘Withdrawal Accounts’, then ‘Payoneer Account’, select the ‘GBP’ currency and click the “ADD ACCOUNT” button. In the next screen select the ‘Bank Transfers’ option and complete the rest of the registration steps.